Goodreads says, "Talking to other people isn't Kate Bailey's favorite activity. She'd much rather be out on the lake, soaking up the solitude and sunshine. So when her best friend, Alana, convinces Kate to join their high school's podcast, Kate is not expecting to be chosen as the host. Now she'll have to answer calls and give advice on the air? Impossible. But to Kate's surprise, she turns out to be pretty good at the hosting gig. Then the podcast gets in a call from an anonymous guy, asking for advice about his unnamed crush. Kate is pretty sure that the caller is gorgeous Diego Martinez, and even surer that the girl in question is Alana. Kate is excited for her friend ... until Kate herself starts to develop feelings for Diego. Suddenly, Kate finds that while doling out wisdom to others may be easy, asking for help is tougher than it looks, and following your own advice is even harder. Kasie West's adorable story of secrets, love, and friendship is sure to win over hearts everywhere." Kasie West's novels are PERFECT for summertime. I look forward to lounging at the beach with this one; it sounds adorable! What do you guys think? I know, right? I love a good beach read. Thanks for visiting, Stephanie. OMG Yes! I love Kasie West and this sounds like the perfect summer read! I can't wait to chill out with it --hopefully on the beach! Thanks for visiting, Sara! Sounds like a perfect beach read! Enjoy! Right? My thoughts exactly. Thanks for dropping by, Kay! I feel like Kasie West is constantly coming out with new books, yet I still haven't read any! They sound so cute, I need to give them a try. I know. She truly is a prolific writer. I have a read a few and they are so-much-fun. Perfect for summertime and vegging out. Thanks for visiting, Angela. I don't read this author but I did know upon looking at the cover she was the writer. Now that's book branding for you! Hope you like it! Haha. You are so right, Barb. Thanks for dropping by! I do love some Kasie Wests book! This sounds great too! Yes! They are perfect books to chill out with. Thanks for visiting, Jenea. I need to read a Kasie West book one of these days. Hope you get a hold of it soon! Thanks, Lisa. 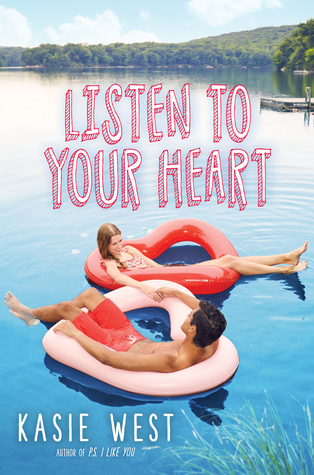 They are perfect books for chilling out and relaxing at the pool or beach. Thank for visiting! Oh I need to check out so many of her books...never enough time in the day/week/year! I know! Too many books - not enough time! Thanks for visiting, Eve. This one definitely looks like great beach reading material!! Enjoy, Christina! I know! I am loving the cover. I'm glad you agree. Thanks for visiting, Becky!